The FBI has helped recover an artifact stolen from the Dearborn Historical Museum more than 60 years ago. In a press conference, FBI Detroit Bureau Special Agent in Charge Timothy Slater was joined by FBI Philadelphia Bureau Special Agent in charge Michael Harpster, Supervisory Special agent with the FBI Art Crime Team Timothy Carpenter and Dearborn Police Chief Ron Haddad, made the announcement. DEARBORN, Mich. (WXYZ) — The FBI has helped recover an artifact stolen from the Dearborn Historical Museum more than 60 years ago. In a press conference, FBI Detroit Bureau Special Agent in Charge Timothy Slater was joined by FBI Philadelphia Bureau Special Agent in charge Michael Harpster, Supervisory Special agent with the FBI Art Crime Team Timothy Carpenter and Dearborn Police Chief Ron Haddad, made the announcement. According to the FBI, the powder horn was made in 1757 and stolen from the Dearborn Historical Museum in 1952, shortly before an exhibition called "Saga of a Settler" was open to the public. At the time of the exhibition, the powder horn was on loan from the Detroit Historical Society, and was returned to the society on Tuesday afternoon. Will be exposed until their creuel rage"
The powder horn was one of the most significant artifacts in the exhibit and had belonged to John Nowlin, one of the earliest settlers of "Dearbornville" which is now Dearborn. Nowlin came to Dearborn and it was in his family's possession. At the time, Dearborn police conducted a theft investigation but couldn't find anything. In 1991, the powder horn appeared for auction at Christie's Auction House and was sold to an unknown buyer. 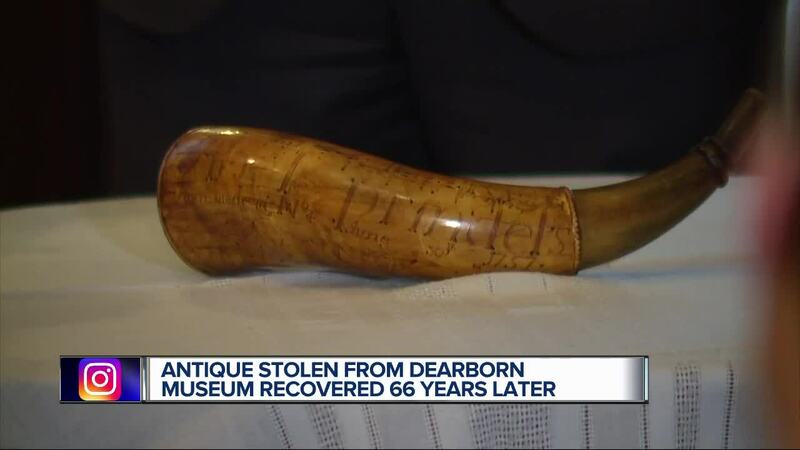 In 2017, Dearborn PD called the FBI, and in late 2018, the FBI Detroit Division and Art Crime Team - Philadelphia Division, were able to recover the horn.